Ryanair, Europe’s favourite airline, officially launched the second year of its exclusive partnership with the Erasmus Student Network. Over 150,000 ESN members signed up during the first year of the partnership, saving over €5m on their travel costs. Students can now sign up once again this year, with ESN membership available at over 500 higher education institutions across 40 countries, and avail of these exclusive travel discounts with Ryanair. “After the huge success of Year 1, we’re now pleased to launch the second year of our partnership with the Erasmus Student Network. Ryanair and Erasmus have done more to promote mobility, particularly youth mobility, and European integration than perhaps any institution over the past three decades. 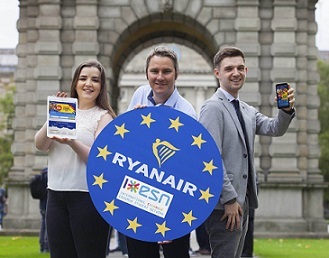 More than 150,000 students signed up to Ryanair’s exclusive partnership with ESN in the first year, saving themselves over €5m, and as students head back to university this month, we encourage all ESN members to sign up this year.